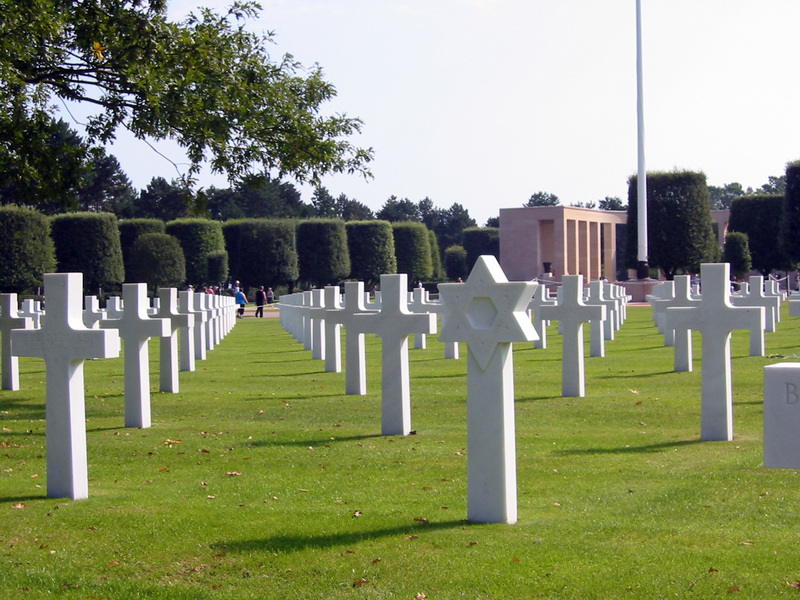 It’s an easy 3 1/2 hour drive from Paris to the D-Day beaches in northern Normandy. Although the battle ended 60 years ago, the remains are everywhere from the souvenir stores to the museums to the countless cemeteries. Gretchen is passionate about the WWII European theater and most of what I know about the D-day invasion I learned from her. We booked a room at the Chateau L’Isle Marie. About 10 minutes from St Mére Eglise and Utah Beach, this 17th Norman manor, a mixture of modern conveniences (like showers) and a museum of 19th century furnishings and bric-a-brac is run by Dutch born interior designer, Dorothea de La Houssaye and her cousin, British born Simon Rock de Besombes, the descendants of the original D’Aigneaux and Aux Epaules families who have been on this property since the 11th century when there was a Viking fort on the grounds. The Chateau and the apartments renovated into the old Military Hospital on the grounds have been painstakingly restored. 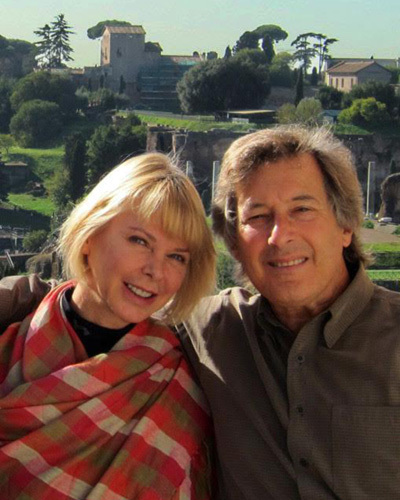 It’s comfortable, charming and like living in a living museum. The estate is in the middle of a swampland and during the winter months the area floods and the Chateau literally becomes an island. We are very much in the country. It’s so quiet you can actually hear nothing except the local critters. On our second night there, a crash through the open window woke us up. We weren’t sure what it was, although our first thought was a ghost. We had heard reports that the Chateau was haunted but we figured that was just a PR tale to attract guests. After a few minutes of something thrashing against the walls, Gretchen turned on the light and we got a good look at a very large barn owl, I’m talking an 8 pounder at least with at least with a 4’ wingspan. Unfortunately though, owls are nocturnal, and the light really disoriented the bird. I admit that for most of the adventure, I remained under the blankets (occasionally pulling them over my head when the owl swooped over me) as I watched a naked Gretchen snapping a towel at the bird, trying to get it to fly back through the open window. The room was filled with lots of antique bottles, vases, paintings and bric-a-brac. The owl crashed into one closed window after another, one mirror to the next, from the bathroom to the bedroom looking for an escape. I can understand why it flew into the glass but I still have no idea why it flew into the portrait of Dorothea de la Houssaye’s grandmother? We were amazed there weren’t broken vase chards all over the floor. We were amazed we didn’t wake up everyone in the Chateau. We opened every window in the room, and eventually the owl managed to fly out to freedom. 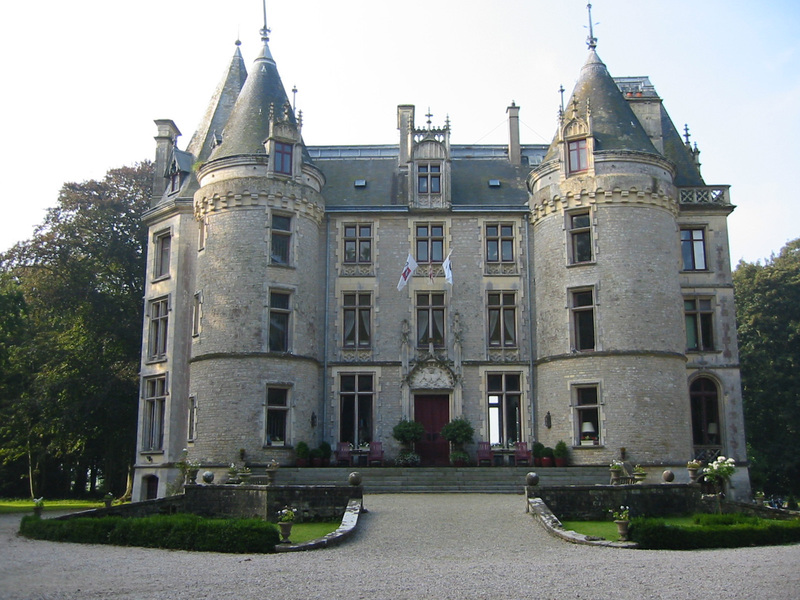 During the war, the SS occupied the Chateau. We wondered what an SS officer would have done if an owl flew in; probably shot it. We also wondered what kind of story the owl told his friends and family about the large wingless creatures with no feathers he just ran into. On our first evening in Normandy, we made a visit to St Mére Eglise, one of the objectives of the 82nd airborne paratroopers during the D-day invasion. It was also made famous by the movie “The Longest Day”. 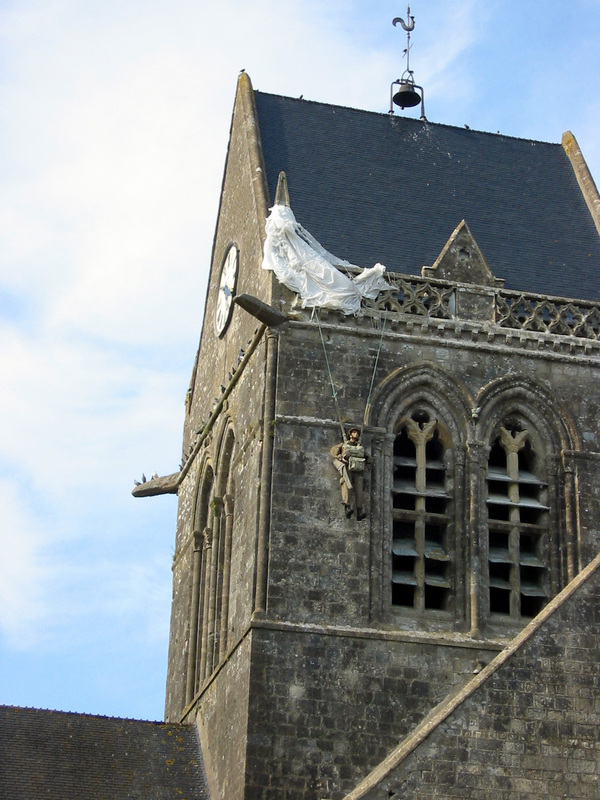 In the movie, Red Buttons portrays Pvt John Steele, the poor soldier who’s parachute stuck to the church steeple where he remained for two hours pretending to be dead as the battle ensued below. Today, there’s a manikin suspended from the steeple as a memory of John Steele. In fact, John Steele is also the name of the favorite local hotel and watering hole. The real John Steele, a small, rotundo fellow, became a local hero. In the airborne museum very close to the infamous church manikin, there are countless photos of this little man with the mayor, the local dignitaries and of course the most beautiful women of Normandy. Today St Mére Eglise remembers the D-day invasion through a tourist trade of Army surplus shops and post card and souvenir stands that line both sides of the main street. The museum dedicated to the brave paratroopers who risked their lives 60 years ago. We spent the next day starting on the hills of Pointe du Hoc, an incredible imprint of bomb craters that have forever changed the visible landscape. 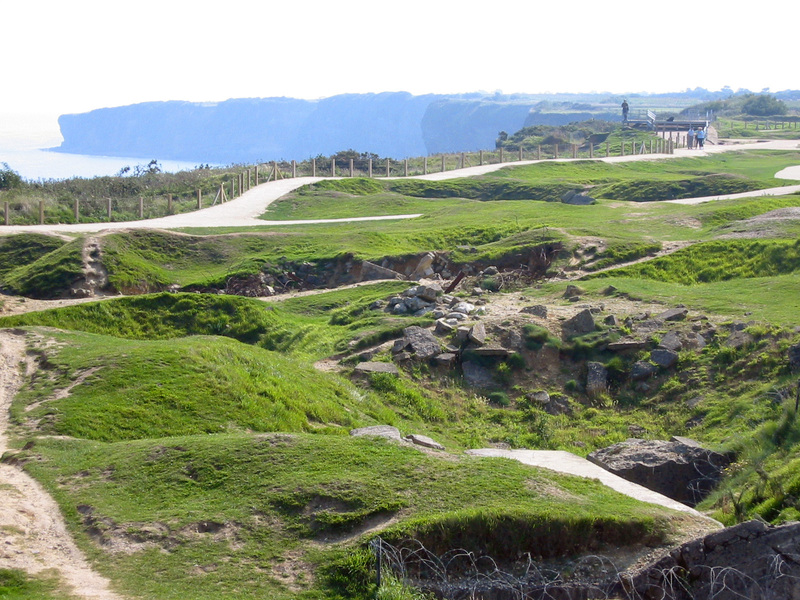 During the D-Day Invasion, the US 2nd Rangers scaled the 100′ tall cliffs under heavy German fire to captured six fortified military bunkers, even though the guns had been removed a few months earlier. From Pointe du Hoc, we drove to the Normandy American Cemetery and Memorial. Here, covering over 175 acres overlooking Omaha Beach are the remains of 9,387 military dead, most of them killed in the D-Day battles. It is a somber place and yet it’s one of the most peaceful places I have ever been to in my life. The symmetrical white marble grave markers are so clean and well maintained, they look as if they were placed there yesterday. At the Memorial are the names of 1,557 Americans who lost their lives in the battles but their remains were never found. 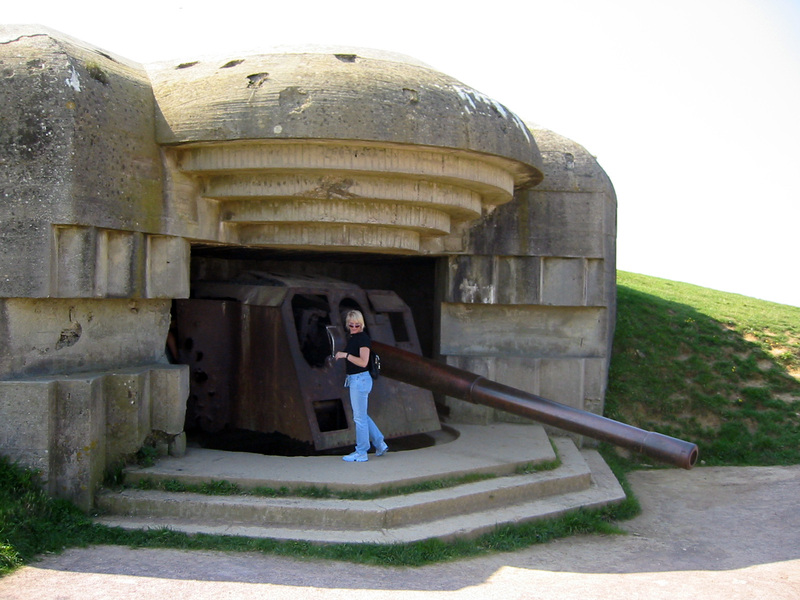 A short drive down the coast, within a short range of both Omaha Beach and Utah Beach are the four large fortified German military casemates on the hills of Longue Sur Mer. The 152mm canons had a 19km range. The Battle of Longues-Sur-Mer was won by the British forces of the D-Day invasion. The guns are still inside the casemates but now they are just a reminder of a very sad time in history. Towards the end of the day we arrived to the Peace Museum in Caen. When Caen was liberated after the battle of Normandy more than 75% of the city was wiped out by bombs. It never really recovered. It’s now a fairly modern industrial city with one amazing museum dedicated to World Wars I and II. The Peace Museum opened in 1988. It is the most thorough war museum we have ever seen, complete with very rare film footage, enigma machines, V1 and V2 rocket prototypes and a lot more. Gretchen was in heaven. The cost is 20€ per person, but we easily spent 3 hours in the museum and still never finished. It’s pretty exhausting. The Castel of Caen (Chateau du Caen) was built by William the Conquerer around 1066, the same time he conquered England. It’s one of the largest medieval fortresses in Europe. It was used as Army Barracks during World War II. Today most of it is used to house the Museum of Fine Arts. We didn’t make it over to the Castle of William the Conquerer, but we did drive south for a visit to the Bayeux Tapestry. We’ve been to this museum before, but anytime we get this close, it’s always worth another visit. I just love this story of the background and battle of Hastings in 1066 when William the Conqueror laid his claim to the throne of England. It’s one of the oldest graphic displays of history in Europe. At 938 years old, the colors and detail of this 230’ long tapestry is really well preserved. 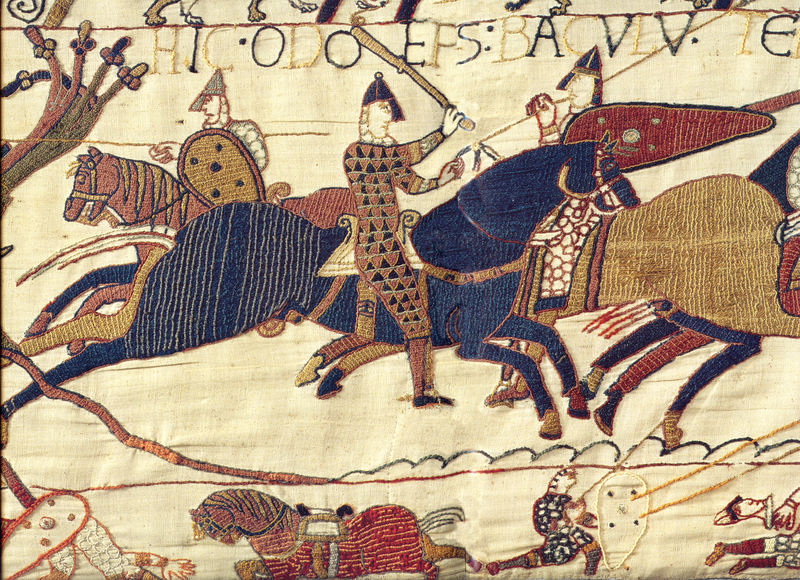 The Tapestry was commissioned sometime after 1070 by Bishop Odo of Bayeux, the half-brother of William the Conqueror. This is the story of how William sailed across the English channel and defeated Harold, the Earl of Wessex in the Battle of Hastings, winning the crown of England and changing history forever.